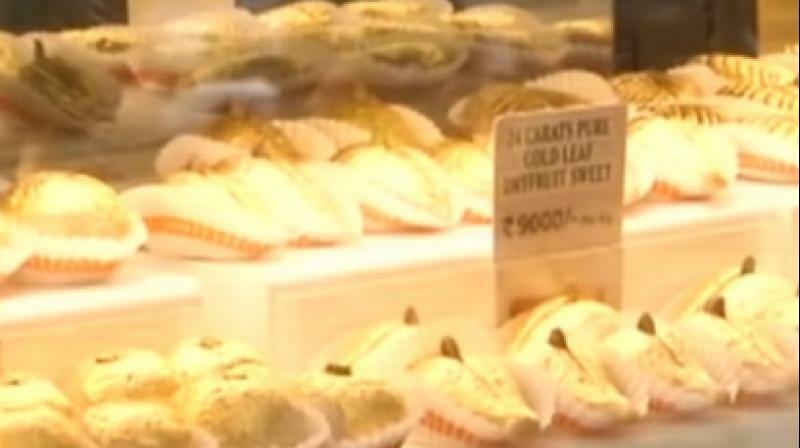 The hefty price tag is due their speciality- the sweets come with a covering of 24-karat pure gold leaf. Surat: Any Indian festival is incomplete without sweets! With the festival of Raksha Bandhan around the corner shops are stacking a variety of these delicacies. A shop in Surat, Gujarat named '24 Carats Mithai Magic' is different from the rest as they are selling sweets for a whopping Rs. 9,000 per kg. "As I entered the shop I was amazed. People in the shop told me that these sweets are good for health. I wish them luck and hope people of Surat are benefited with it," said a customer Divya Shah. When asked how the idea of using gold was arrived at, Prince Mithaiwala, the owner of the shop, said that they came up with it keeping the health benefits of gold in mind. "In place of silver, we have used pure gold leaf as it is beneficial for health. A number of people are buying it as Rakhi is just around the corner," he said. These sweets have been named 'Gold Sweets' and are the centre of attraction for all the customers visiting the shop.